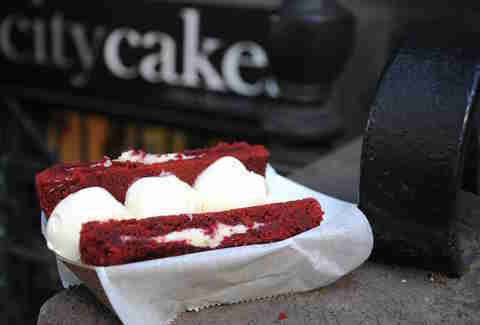 You know where the best ice cream in NYC is. And you know a thing or two about delicious NYC cookies. But somehow, you have no idea where to find the two gloriously combined. Until now. 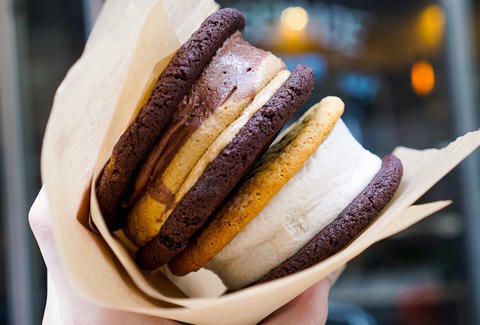 Well, not now, but like, after you read the article below, so I guess, until... five minutes from now, when you’ll be fully educated on NYC’s 13 best ice cream sandwiches. Essentially a mocha in ice cream sandwich form, this glorious combo layers both chocolate AND Counter Culture coffee ice cream between soft dark cocoa cookies. 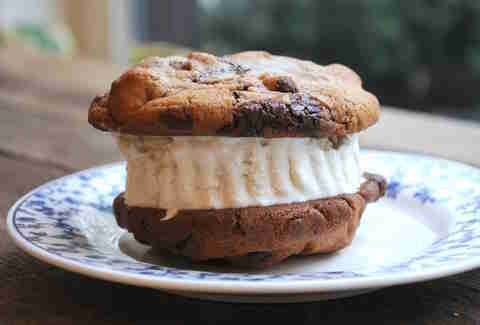 Think of this as a Chipwich on steroids -- the cafe takes two of its hefty nut-studded cookies and stuffs ‘em with a scoop of McConnell’s exceptional vanilla ice cream. But unlike the always-available supermarket treat, there are only 50 of these on sale between Friday and Sunday after 2pm. Mark your calendars. Don’t settle for plain ol’ frosting. 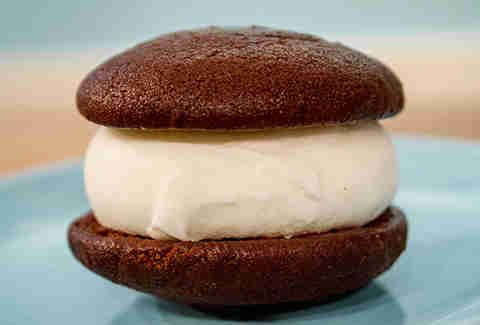 Ask nicely and this whoopie pie specialist will cram a ball of Il Laboratorio’s ricotta gelato between its uber-moist cakes. 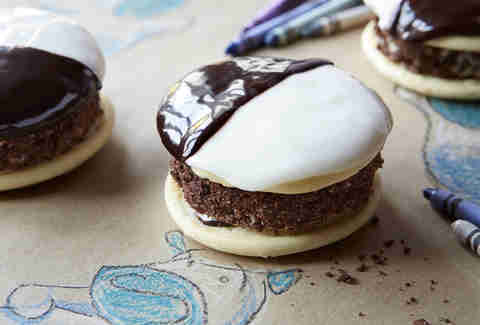 New York City’s most iconic cookie got a summer makeover thanks to two of Brooklyn’s dessert powerhouses. This genius collab shoves Ample Hills’ vanilla malted ice cream and hot fudge between Baked’s black & white cookies and then, as if that weren’t enough, the entire thing gets rolled in chocolate crunchies. In the battle of DKA vs. Cronut, the DKA always wins, especially when you order the flaky, buttery beauty sliced open and filled with one of Ansel’s house-made ice creams. 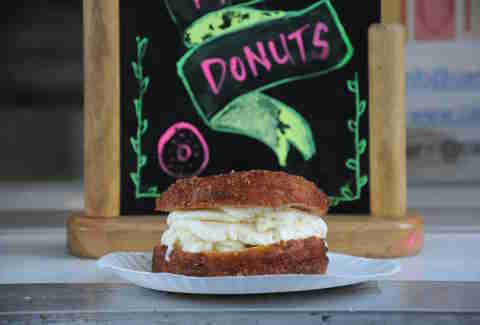 Tip #1: avoid the ridiculous Smorgasburg lines and swing by the Clinton Hill cafe. 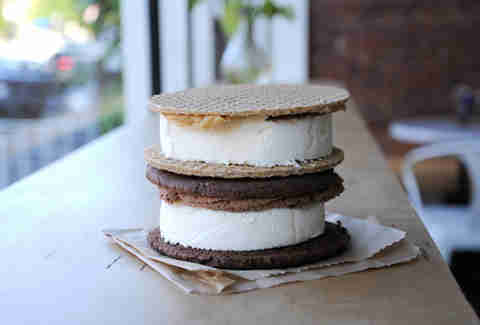 Tip #2: get the signature stroopwafel made with two chewy hand-pressed wafers, Blue Marble ice cream, and caramel. 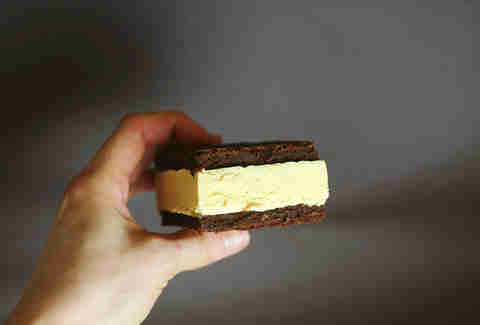 The fudgey, brownie-like wafers will transport you straight back to your wallet chain-wearing childhood, but ice cream options like Drunk & Salty Caramel or Whiskey Fudge Rebellion can help make this a very adult-friendly treat. There’s nothing in life better than a fresh-out-of-the-fryer apple cider donut. 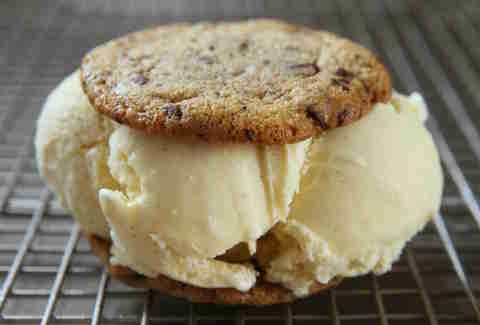 Except one that’s expertly packed with Blue Marble vanilla ice cream. 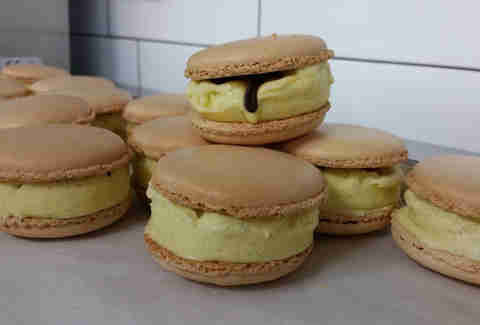 This is not your average dainty French macaron. 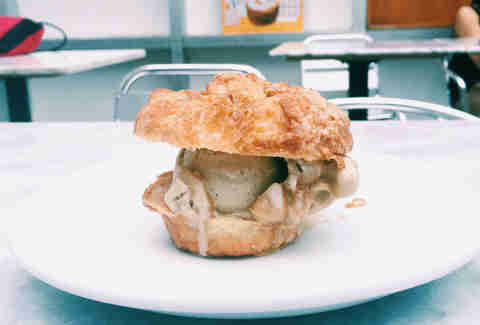 In what may be the most elegant twist on an ice cream sandwich, Simon Tung and Christina Ha bake up plus-sized shells that they jam with vanilla ice cream, plus chocolate and caramel sauces. 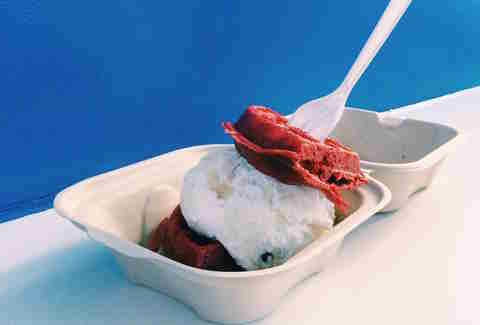 For the summer-only special, the subterranean dessert den turns its half-pound red velvet cookie -- which, by the way, is already infused with cream cheese icing -- into a vehicle for velvety orbs of vanilla ice cream. 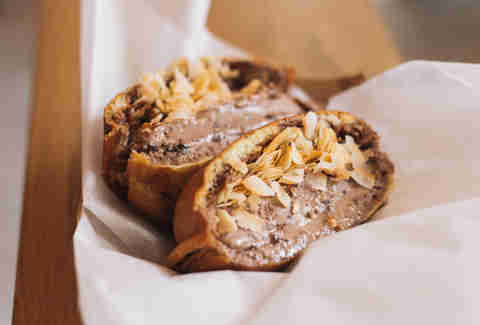 Courtesy of Oddfellows Ice Cream Co.
Oddfellows’ ice cream wizard Sam Mason has conjured up a sophisticated take on the summertime staple in this hot brioche bun oozing with chocolate ice cream, hot fudge, and toasted coconut flakes. As with its namesake dish, the ball-slinging chain goes the DIY route, allowing diners to mix and match various fresh-baked cookies (oatmeal raisin, snickerdoodle) with ice creams (chocolate, brown sugar). You can’t go wrong with any combo.